Two of our favorite things are hiking and waterfalls. Do you know what is really amazing? When you can actually put the two of them together. 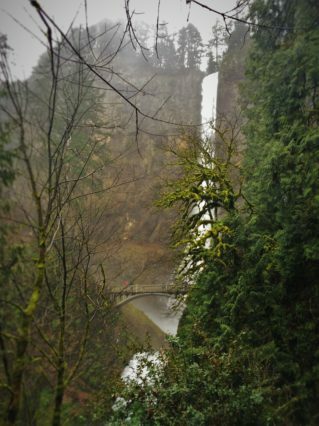 One of our favorite places to see waterfalls almost any time of year is the Columbia Gorge on the Oregon side of the river. 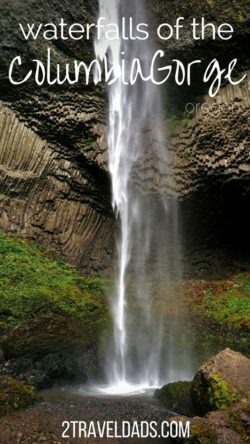 The Columbia Gorge waterfall area is incredible and it’s home to such a variety of waterfalls. 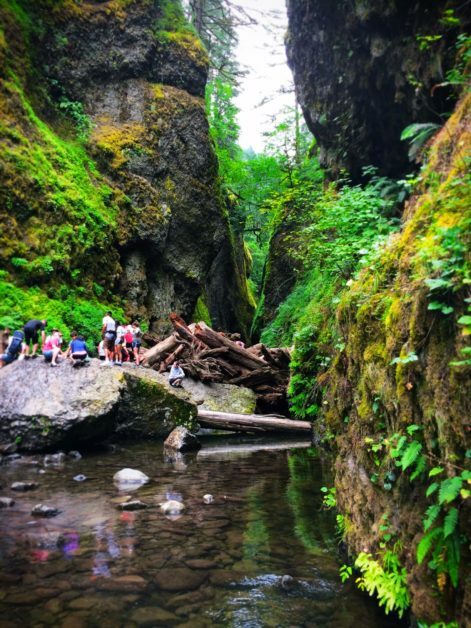 If you’re in Portland you might as well head east and visit all of the many waterfalls and see what you can see. 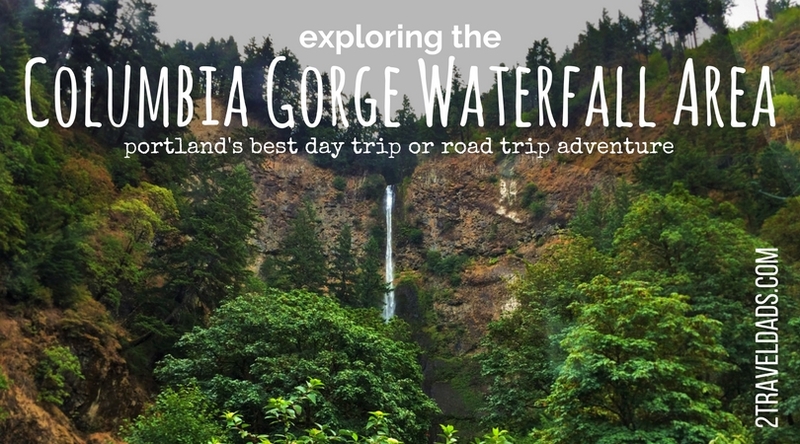 If you’re in Hood River, same thing: go experience the amazing waterfalls of the Columbia Gorge! 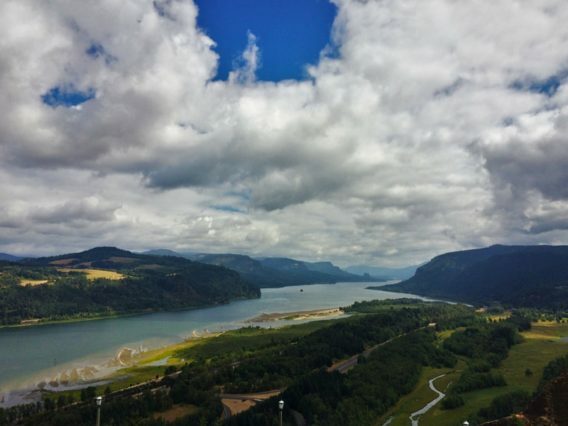 The geology of the Columbia Gorge is really fascinating. On the north side of the river there are buttes, plateaus and the High Prairie. On the south side of the river starting in the east it’s all buttes just like on the north side and then it rapidly turns into lush forests and hills, then turning into cliffs and moving on all the way to the rolling hills around the Portland area. 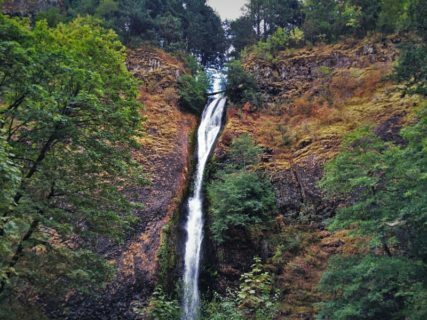 There are two ways that you can approach doing the waterfalls of the Columbia Gorge. You can start in Portland or you can start in Hood River, but it depends on what you want your final destination to be. We’re going to tackle these starting at the western end. Just so you begin on the right foot, starting earlier in the day for this adventure is best, as there going to be a lot of people doing this same route any day of the week. 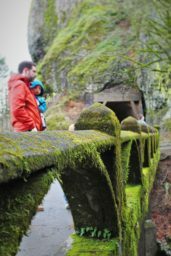 Oregon’s historic Route 30 is a narrow two lane road and it easy to be distracted by the beautiful scenery, the mossy cliffs and the plummeting falls everywhere. The most important thing to remember is that no matter how breathtaking every sight is around every corner, the road is exceptionally dangerous and requires full attention driving. The first sight on historic Oregon Highway 30 is Vista House. Vista House is the coolest little Art Deco building at the top of a cliff overlooking the Columbia River to the west, north, and east. It is the best place on the Columbia River to see a sunset. It’s absolutely beautiful. 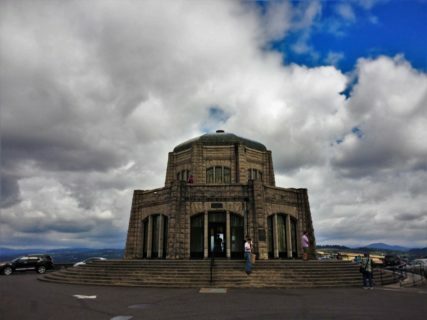 If you’re there during the right hours you can go into Vista house. The stained glass and stone work are just amazing. 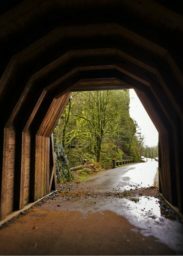 It’s the only man-made sight along the tour of the waterfalls of the Columbia Gorge. 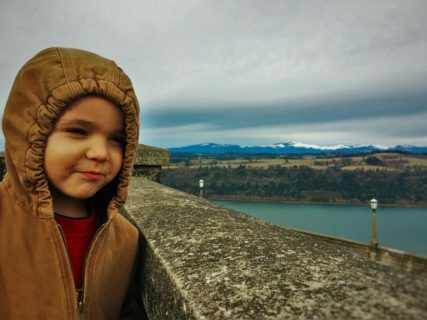 Tip: any time but the summer is WINDY and cold at Vista House. It’s a great place to propose or to wow your kids with shocking gusts of wind. The next stop as you head east on Oregon Highway 30 is Latourell Falls. This is a really interesting stop for a couple reasons. First off you can see the falls from the road or the parking area but you might as well do a tiny hike. Hike #1 heads up the hill to a really great viewpoint and the falls is completely visible so you can call it good if you like. Hike #2 goes from the parking area to the base of the falls. This is the best hike. The trail is kind of scary because the land has shifted and bits of the trail have washed down the hill. All in all though it’s plenty safe. We’ve done it with a stroller and without several times. Note: we use the term “hike” very liberally. 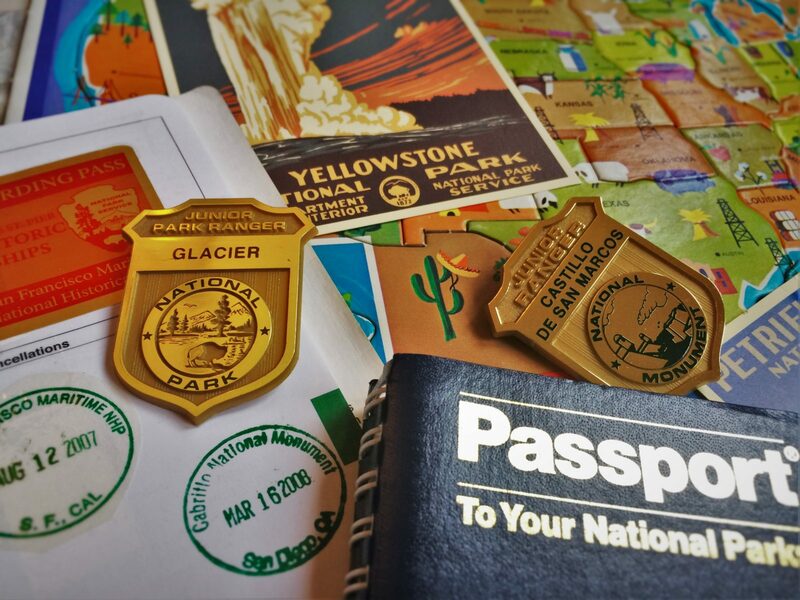 Yes there are real hikes available, but getting to the general view areas aren’t actual hikes. Tip: allowing 20 minutes for this stop is fine. It’s not even a quarter mile back to the base of the falls and you can only sit and ponder them for so long. 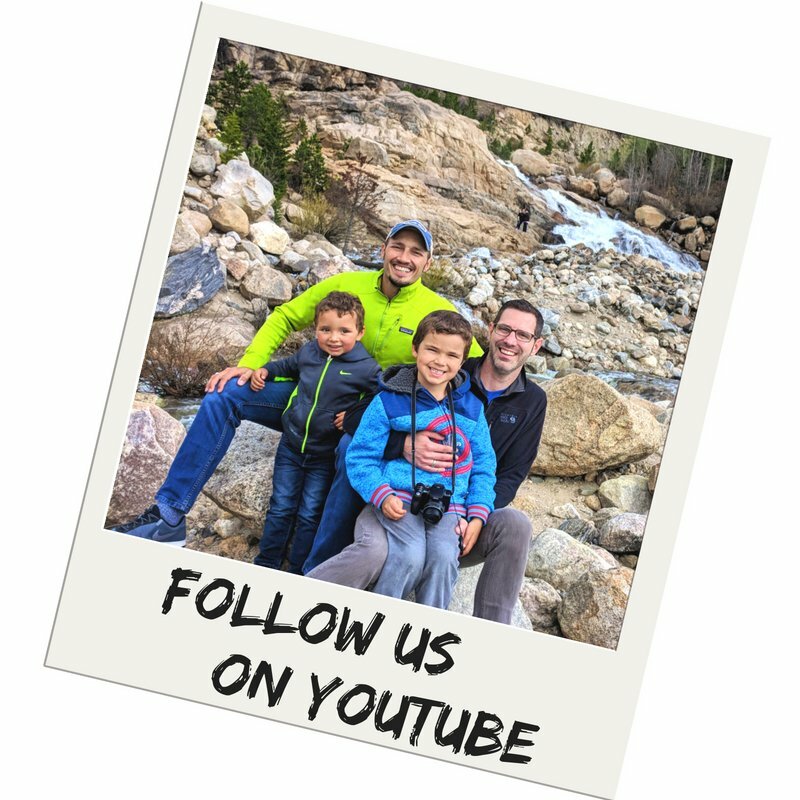 Tip 2: there are other hikes you can do out of this spot, so if you do have extra time, plan on a short jaunt up the hill or along the canyon floor. The next set of falls you come to is Bridal Veil Falls. We actually never stop here. We probably should but we always skip it. It’s a neat waterfall because it’s broken into two segments which makes it really different than the other waterfalls of the Columbia Gorge. When we’re down there next time, which will be in a month, I am sure that we will make a stop here. If so, we’re share what tips we learn. Tip: ask a local for a hiking recommendation for Bridal Veil Falls, as it is a two part waterfall with a few different hiking options. Wahkeena Falls is a really cool waterfall. It is a cascade vs an outright plunge. The parking area / rest area is really unusual. This might sound like a weird thing to call out but we really love the bathrooms here. The bathrooms actually have murals and really cool stone work. Besides the bathrooms the cool thing about the public area is all of the picnic tables, and then there’s the pathway that leads to the falls. 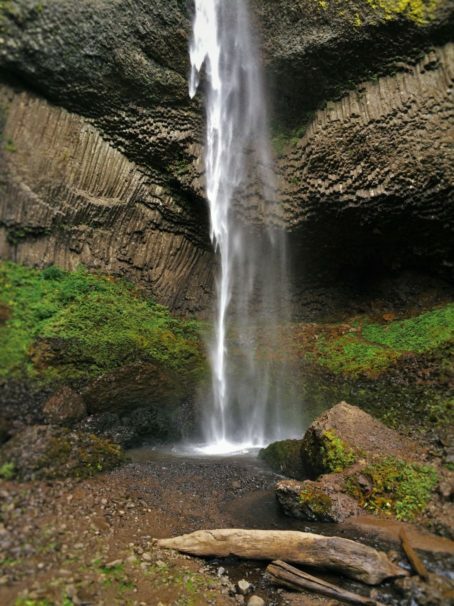 If you’re touring the waterfalls of the Columbia Gorge at lunch time, this stop is your picnic zone. 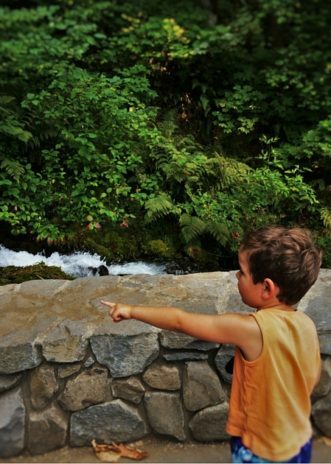 Wahkeena Falls is really fun for kids because they can walk alongside the rushing water and it’s never quite too high. I think that if this was in a tropical Location there would probably be orchids and toucans all the way along the cascade as it comes down the hill. 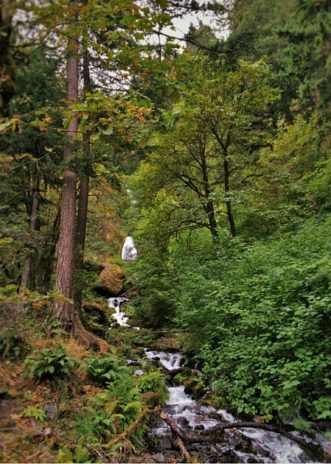 This is one of the most relaxing spots of all that you’ll stop at, as it’s the least populated of all the waterfalls of the Columbia Gorge. 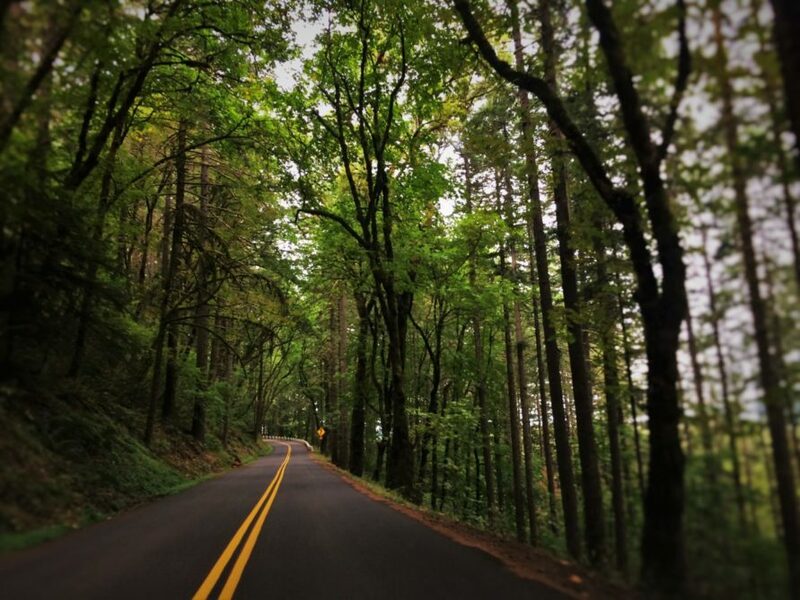 Tip: take advantage of the restrooms here as there aren’t many along Oregon’s Historic Highway 30. 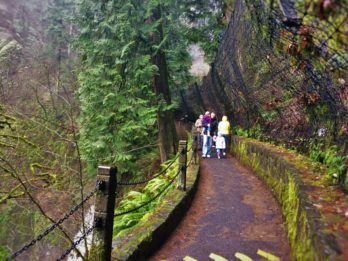 Multnomah Falls has facilities but it is the most visited tourist attraction in the State of Oregon and at any given moment there will be hundreds of people in a small space… all needing to pee. 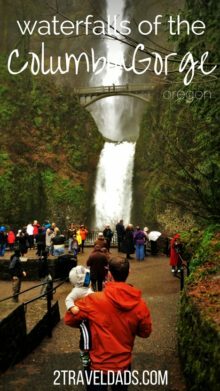 Multnomah Falls is the busiest tourist attraction in all of the state of Oregon. Just know this before you even try to park. Parking can be tricky whether coming from highway 30 and parking in the smaller lot or coming off of Interstate 84 and parking in the easy access lot. Either way parking can be tricky. The thing that makes Multnomah Falls neat is the setting. 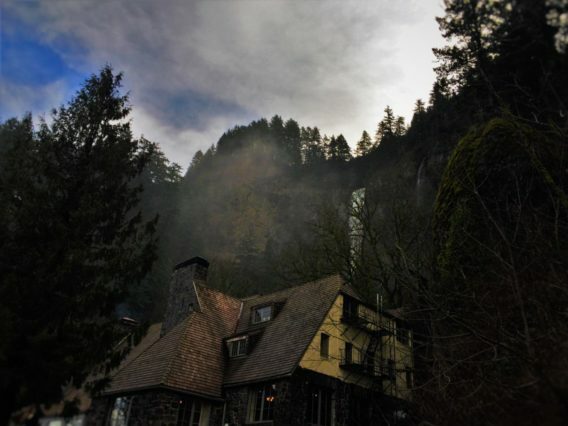 Everything is covered in moss: the lodge (which you cannot stay at and is actually a restaurant), the gift shop, the restroom, the coffee shop, the paths, the footbridges… The creek that feeds Multnomah Falls runs all the way down to the Columbia River and you get to walk along a good portion of it before you get to the falls. It’s all gorgeous with moss and cut stones. 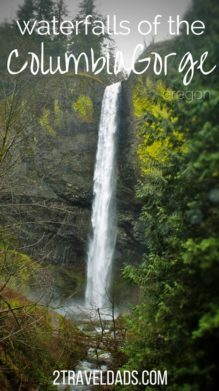 Really, it is worthy of being the busiest tourist attraction and is the gem of the waterfalls of the Columbia Gorge. Can you tell we love it here? 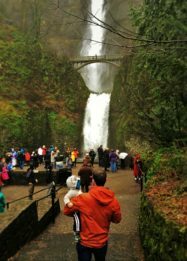 Multnomah Falls is split into two waterfalls: the lower one which is pretty short but still beautiful, and then the upper falls, which you can walk up the long path to get to the most picturesque little bridge. 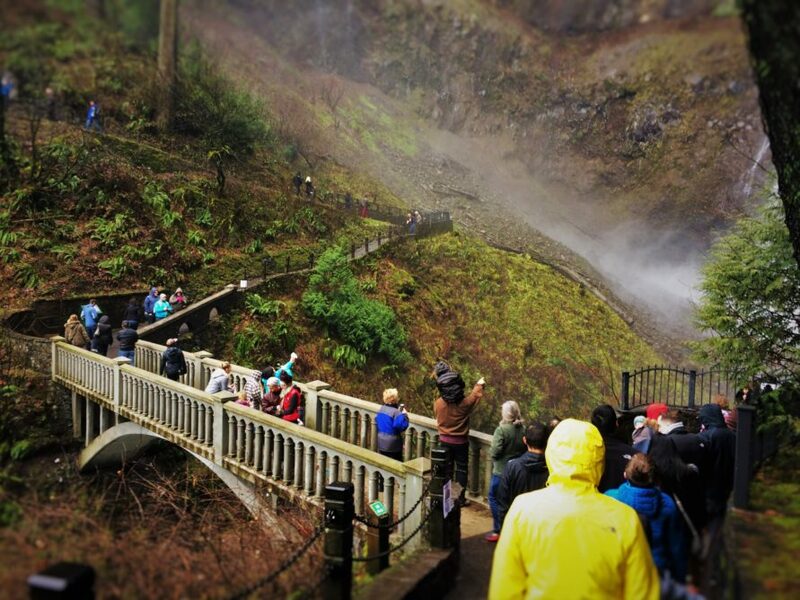 Just like with other waterfalls in the Columbia Gorge, Multnomah Falls has lots of mist. Be prepared to get soaked at either the lower or the upper falls view points. In the summertime it’s not going to be so bad because the water level is much lower and not as much water spilling over and splashing everywhere, but in the spring and winter, and heck even in the fall, you’ll see higher water levels and a great deal of mist, and all of this mist is what makes all of this so beautiful. Tip: light for photographing the falls is best during the early afternoon in the summer, but that’s also when the water is at its lowest and least impressive. In the autumn through spring, hit the falls in the late morning or mid-afternoon to get enough light, but not crazy bad shadows. Tip 2: just deal with the mist. It’s so very worth it to enjoy some moments in front of the falls. Tip 3: if you don’t do the short walk up to the arched bridge and get close to the upper falls you’ll wish you did. Yes, you’ll get wet. 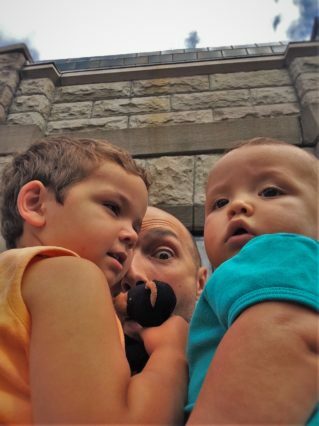 Yes, you’ll make funny faces and have kids with their eyes closed in every picture, but it’s wonderful just the same. 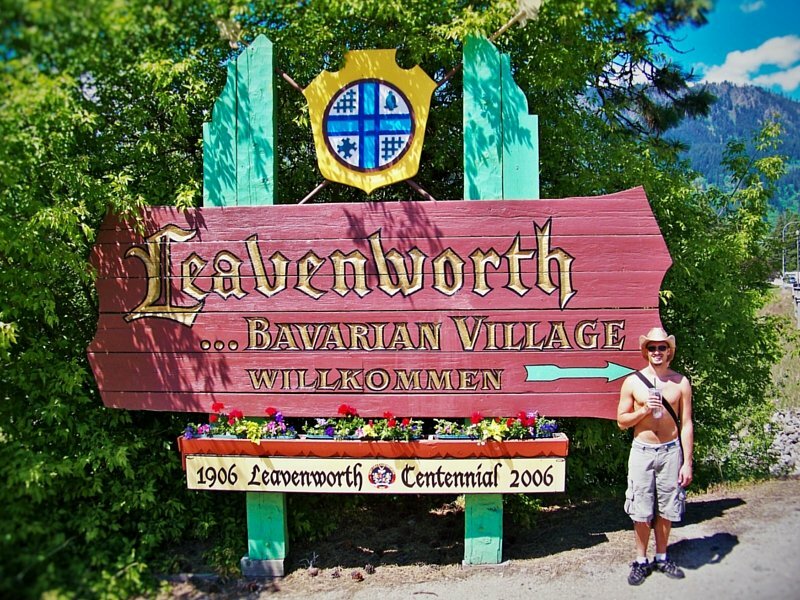 So this is a stop that’s both amazing and, um, in the winter might be a bummer. 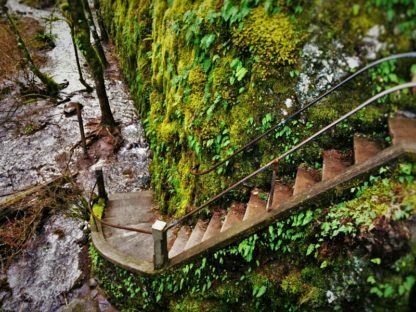 Here’s what you experience from the road: you see some sort of foot passage / tunnel, you see some sort of foot bridge that’s covered in moss, you see a tight canyon that is also covered in moss and ferns, you know there’s something beyond all of this… but what? Yes, this is a very mysterious stop and it’s just begging you to explore and you should if you have the time and a second pair of shoes to change into afterwards, because your feet will get wet any time of year. Here’s the thing about visiting in the winter: there has been rain and snow for a few months, so the creek has superceded its banks… and you can’t walk up into the Gorge. In the summer, it’s very different, as you can continue up through the Gorge to Oneoneta Falls. Either way it’s a beautiful site and worth going down to creek level to explore. 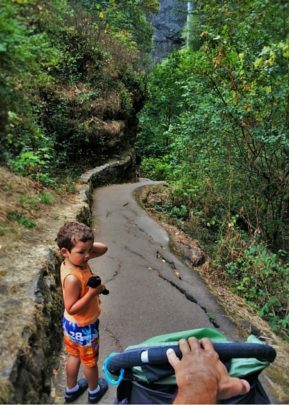 This stop is unusual among the many options along the waterfalls of the Columbia Gorge. 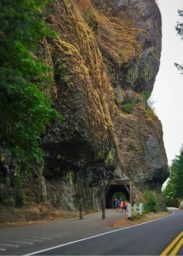 Tip: there is limited parking directly next to the Gorge entrance, but to the east of the creek there is a tunnel to walk through and additional parking. Take advantage of that, and if you have kids with you, this will be an added thrill due to the tunnel. You can also yell really loudly in the tunnel… and everybody loves to do that. Horsetail Falls is great because it’s the last one before you’re done with the waterfalls of the Columbia Gorge tour. 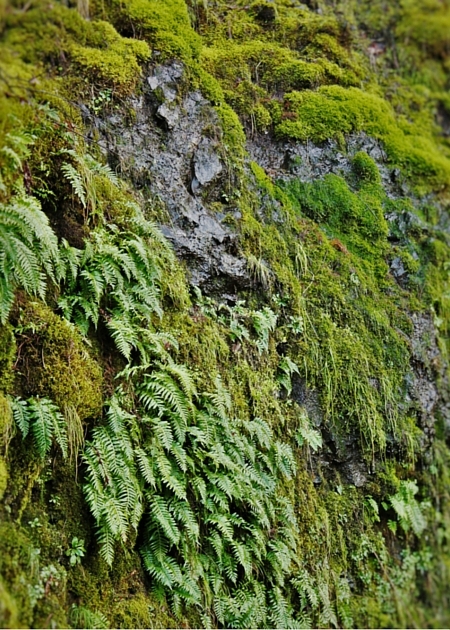 Horsetail Falls is the perfect stop (or not) to see from the road. It’s big. It’s beautiful. It’s splashy! We love this stop for the sheer thrill of it. Again, winter is the best time to see it because the greater the water level the better the display, but kids love it any time. 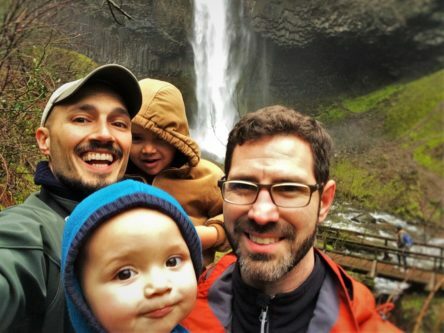 We found that the kids had the most priceless reaction, not to the sight of Horsetail Falls, but to the sound. The water flows from the base of the falls directly under the bridge, which is also the splash zone and between that raging creek and the splashing falls, the sound is better than the best sound machine you could ever hope to buy. It just so fun to experience on a day of family travel. Tip: there is parking for the falls, but there’s not a ton of it. There is a parking area that you must enter from the east end or there’s a tiny bit of street parking accessible from either direction. 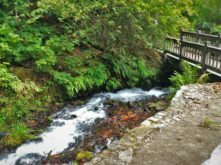 We’ve stayed in a few places when we’ve visited the waterfalls of the Columbia Gorge, ranging from downtown Portland, Oregon to Lyle, Washington, and even at the Skamania Lodge in Stevenson on the Washington side. 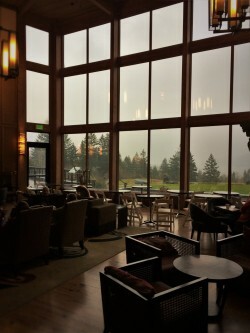 Our most recent trip had us traveling out from the Skamania Lodge. It’s on the north side of the Columbia River and is in the most beautiful setting. The lodge has a fantastic lobby with a grand stone fireplace and ample seating. We enjoyed the outdoor rockery-style hot tub each evening we were there too. The rooms are nice with very lodgy touches, including hints of the Native American culture you’ll find all around the area. At the hotel you’ll also find the Waterleaf Spa, which we really enjoyed. This was actually the highlight of the Skamania lodge for us. We enjoyed the private sauna and whirlpool prior to some really incredible 80 minute massages… but that’s a story for a different time. Another great option is to make Hood River your base and then you have access to the waterfall area, Mt. Hood, the Dalles and more. 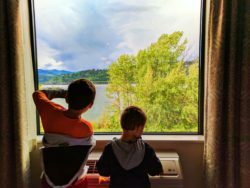 We enjoyed a long weekend at the Hampton by Hilton in Hood River. It was ideal for being centrally located and perfect for the kids since there was a great pool, breakfast, and an overall fun environment. The room sizes were also quite generous which always is a plus when you’re traveling with kids. Hampton by Hilton in Hood River is located just off the Columbia River across the foot bridge from the Historical Museum. If you want to have river access, restaurants and breweries within walking distance, this is the spot for you. Oh yeah, and if you’re a wind surfer or kite boarder, why would you look anywhere else? The Hampton is nearly brand new and right off the Event Site. Perfect! Isn’t it great to know that there’s such a wonderful natural activity/tour you can do just right outside of another destination? Heck yes! Portland is only 45 minutes (at most) to the west of the waterfall area and Hood River is less than a half hour to the east. 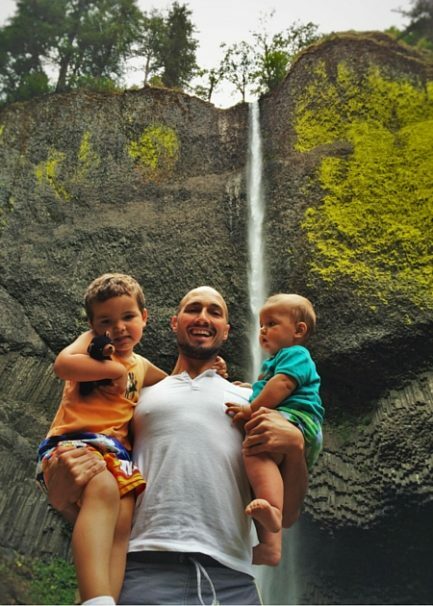 If you’re heading to either location, please do yourself a favor and spend half a day or more exploring the amazing natural collection that is the waterfalls of the Columbia Gorge. 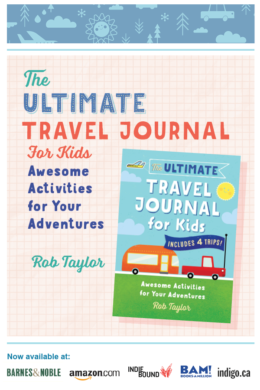 Want to pin this for your next big Travel Oregon adventure? Go for it!! Ooh, I love this! 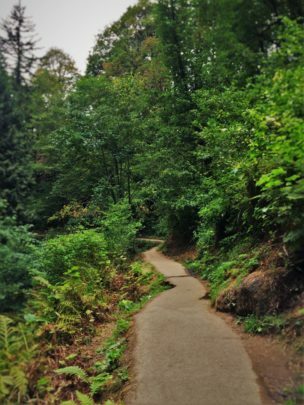 I live in Portland but I’m guilty of not getting out to explore the areas around it enough. I also didn’t know Multnomah Falls was the busiest tourist attraction, but it certainly does make sense if all the selfie sticks I’ve seen there are any indication, haha. 🙂 Thanks for the tips! Sorry for the bad pun but the falls look gorgeous! I live on the opposite end of Oregon, but I really should spend more time in the Columbia Gorge. My experience has been little more than driving by Multnomah Falls. 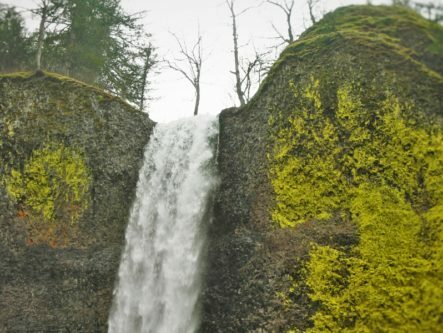 I had no idea that Oregon had such a beautiful and scenic route with such amazing waterfalls. Oregon and waterfalls had never even crossed my mind before I read this. 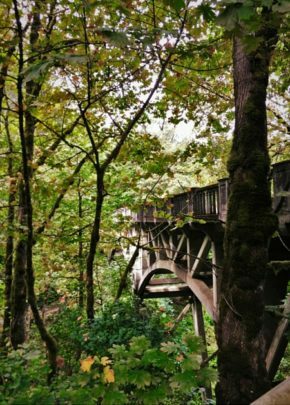 It looks like such a great experience for hikes and views! 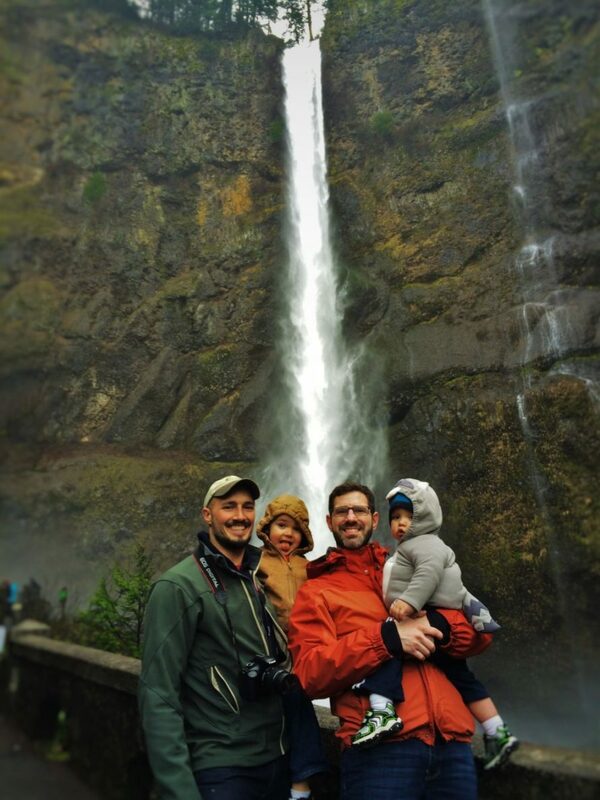 We love the columbia gorge and all these falls! It is so close to us, we love going to hike! 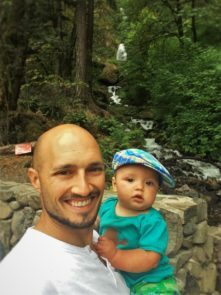 We love waterfalls too, nice post, liked the portion about the Horsetail falls best. Neat. 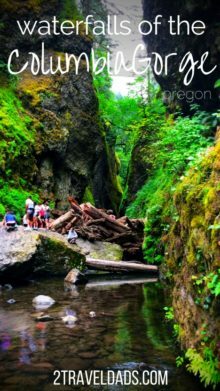 I’m going to bookmark this page – I live in Eugene, but we’re planning an adventure along the Gorge this fall. 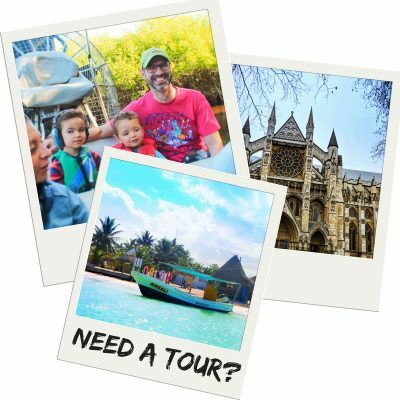 I love the puns in the comments;) Great tips for what looks to be a great place to visit. Added to my growing list! Lovely! I personally prefer slow shutter speed shots of flowing water (falls, rivers, sea, etc.). But the itinerary here is what grabs me! Once again you’ve done it! I’ve got to come north to Oregon again for this epic road trip! I love the idea of Vista House. Treasures like that are so worth stopping for. i fall more and more in love with your site very day that I see those cute little faces and those clever pins! This is such a great guide! The walk sounds beautiful with an incredible number of waterfalls. 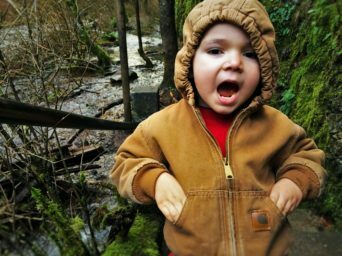 I enjoy hikes such as this one where there’s lots to see and keep the kids moving along. I’m particularly intrigued by Vista House – why is it there?? First of all – gorgeous photos! Secondly, I really love the way you have these photos laid out. You have so many beautiful photos to share and being able to see them all gave me a good glimpse into what these waterfalls are like. Oregon was never on my list, but because I love nature, I’ll have to add it now. 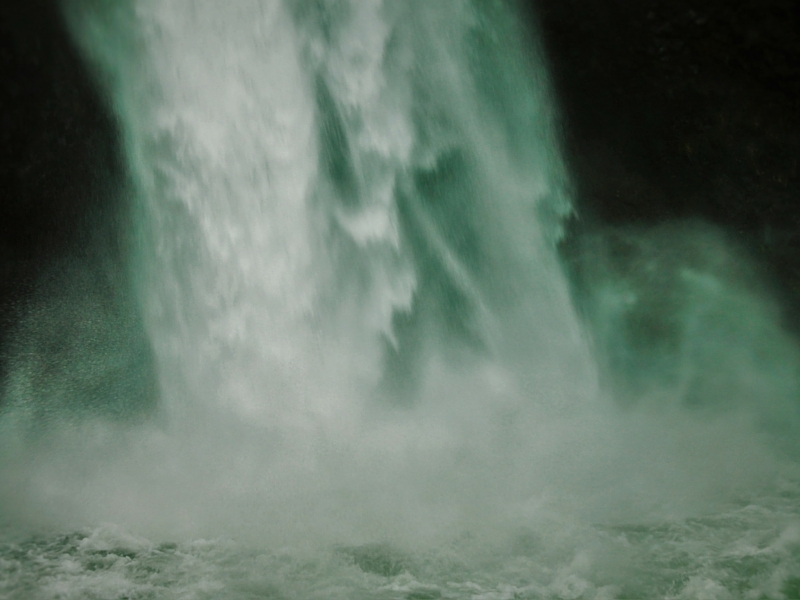 I love fresh water and waterfalls in particular so I really enjoyed this post. 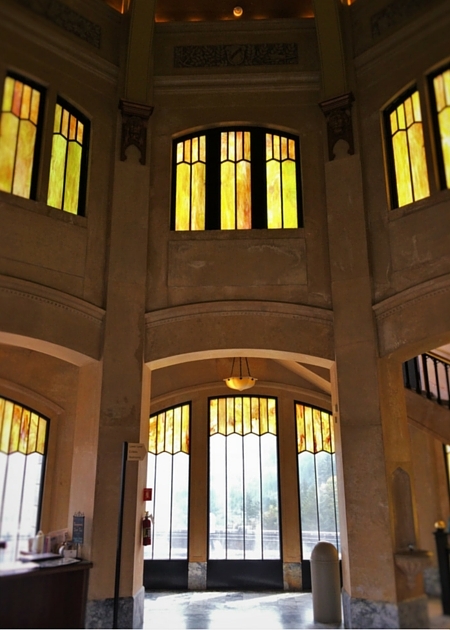 Also, Vista House seems incredible, I totally agree a proposal there would make quite an impression! As usual, awesome photos. Also, I love the “tips” you do in your posts. Looked like a fun time! It’s refreshing to see your pictures, kids make better pictures than all the same pictures of people posing on beaches in bikinis! 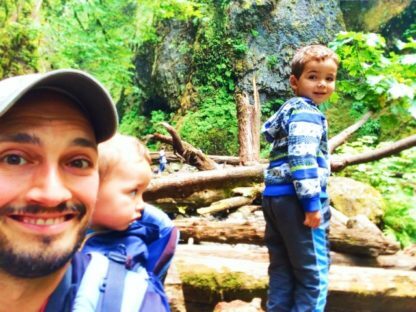 My husband and I are traveling to Oregon for the first time with our very active 2 year old. 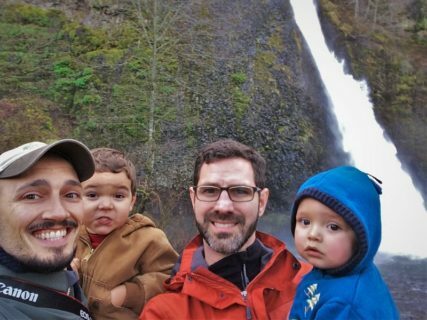 We love the outdoors and want to see the waterfalls but our nervous with our son. 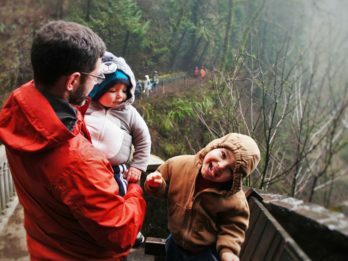 Can you give us your best tips when visiting the falls with toddlers? Thanks! I think you’ll find that they are all pretty easy to visit. Bridal Veil is the only one you HAVE TO hike to, but if that feels like too much you can skip it. Be sure to take advantage of the picnic areas for lunch and play space. 🙂 Have fun!